The binding recommendation means worker will have now contracts of a minimum of seven hours. 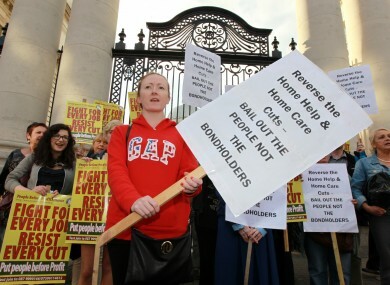 Home care workers at a protest last year over budget cuts. THE LABOUR COURT has said that home help workers should have contracts of a minimum of seven to ten hours work each week, ending the practice of zero hour contracts. SIPTU, which represents home help workers, said this recommendation puts the terms and conditions of 10,000 home helps employed by the HSE on “a firm and binding platform for the first time since the community service was established thirty years ago”. It also included commitments for the reversal of the overspend on private sector providers, which SIPTU said “will benefit the service and also allow for greater investment in public services in the community”, while also generating value for money. Health Division Organiser with SIPTU Pail Bell called on the HSE effort to re-organise and manage the service in a “robust manner” on a county by county basis. Email “Labour Court ends system of zero-hour contracts for home helps”. Feedback on “Labour Court ends system of zero-hour contracts for home helps”.